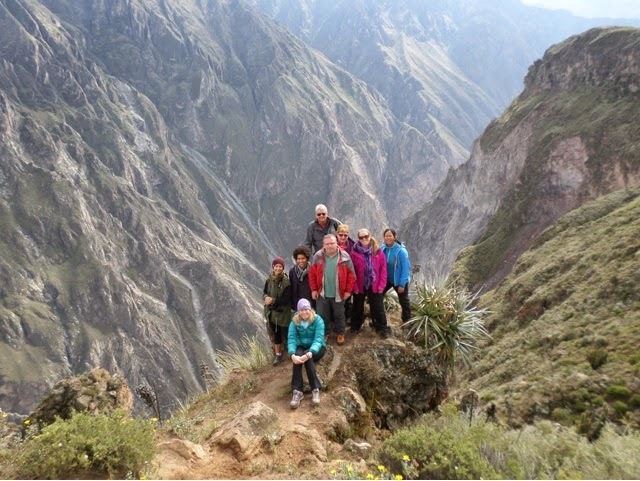 We all jumped in a mini bus and headed to Colca Canyon. The drive was amazing. The first jaw dropping scenery in Peru and the kind of landscape I had pictured. In places it was almost like the highlands of Scotland with the scrubby mountains and wetlands. We also got to see lots of great views of volcanoes! Shocker! Even more chocking it was sunny, I almost went into shock :-). The drive to Chivay town, our destination for the night took around four hours. The drive took us through the national reserve. 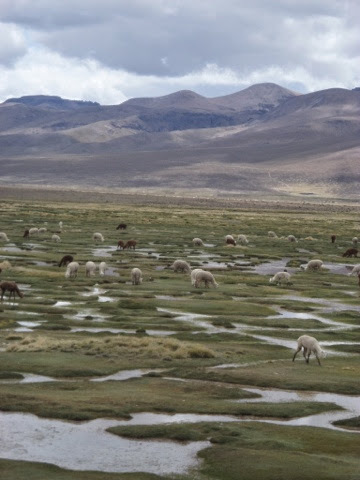 This is a special area reserved to the protected Vicunas. Peru has four types of camel, of which we saw three, llamas, alpacas and vicunas. Vicunas are the smallest of the three and are as mentioned a protected species, which means you cannot kill them or eat their meat. You go to prison for 3-5 years for killing a vicuña. The shepherds living on the national reserve are allowed to shear the vicunas fleece around once every seven years. 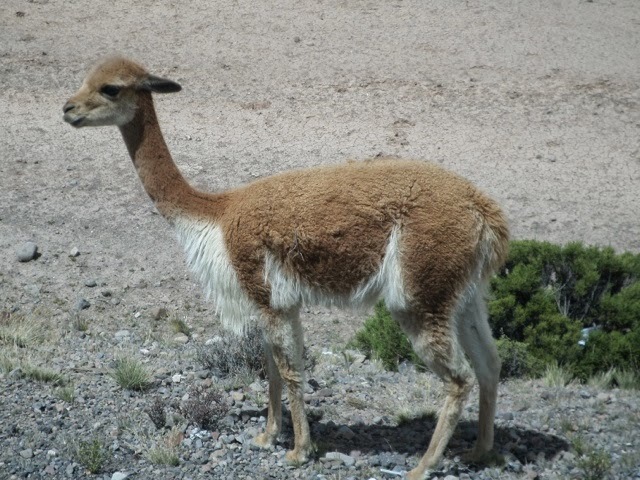 Vicuña wool is the finest available and each strand is thinner than a human hair. As a result products made of this wool are extortionately expensive. Vicunas look more similar to alpacas than llamas and have brown and white fur. They are also quite small. Vicunas are wild animals and have never been domesticated and so don’t hand around in herd in the way that llamas and alpacas do. We saw quite a few just along the sides of the highway and they’re pretty cute looking. Vicunas forms groups of seven, one male and six females. Once babies have reached adulthood they are expelled from the group. The young males group together in large groups. You get males will fight older males to take over their family group. Of the older male loses he is expelled from the group and then spends the rest of his life on his own, quite sad :-(. Therefore you know from the number of vicunas you see whether you are looking at a family group, young males or an older male. We also saw large nerds of llamas and alpacas, which are farmed for meat. The farmers shear them for their wool approximately every 2 years. Alpaca, especially baby alpaca is very high quality wool no can be very expensive also. You see the alpaca sweaters everywhere in the shops and markets around here. We stopped for a mug of coca tea. To help with the altitude. As we are moving up to close to 5000m and at every stop you have groups of indigenous ladies selling craft wares, sitting knitting and crocheting. 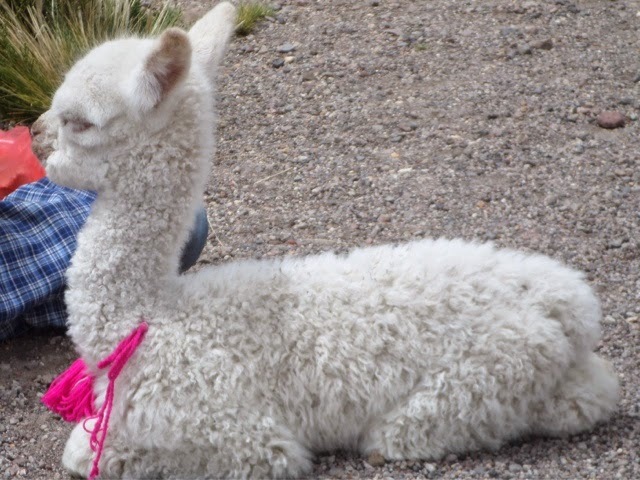 You also have women who wait for you with super cute baby alpacas and for a sole you can take a picture. The babies are switched every day so are not separated from their mothers for long, they’re usually only a few metres away. It is sad though that many of the women keep their small children with them as many tourists want to photograph the kids. They are very cute looking but this is creating social problems as the children are prevented from attending school I. Order to help make money for their families. Baby alpaca…. I want one… Soooooo cute! We reached the highest point, at approx. 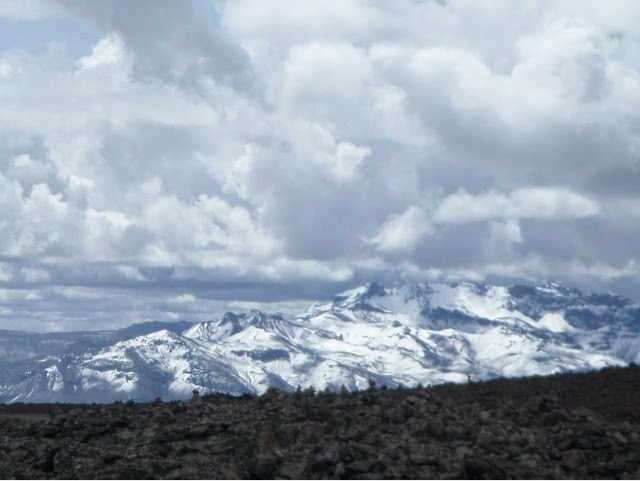 4950m, called Patapampa with views of several volcanoes. You could definitely feel it getting cold and there was even hail! 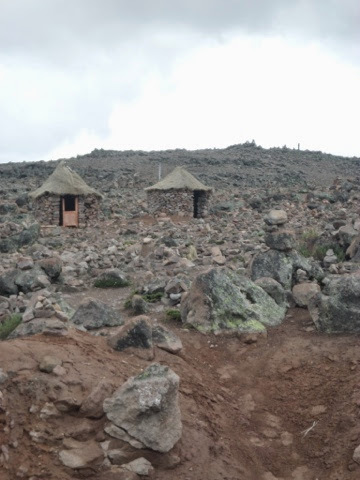 Little houses on the rocky terrain. 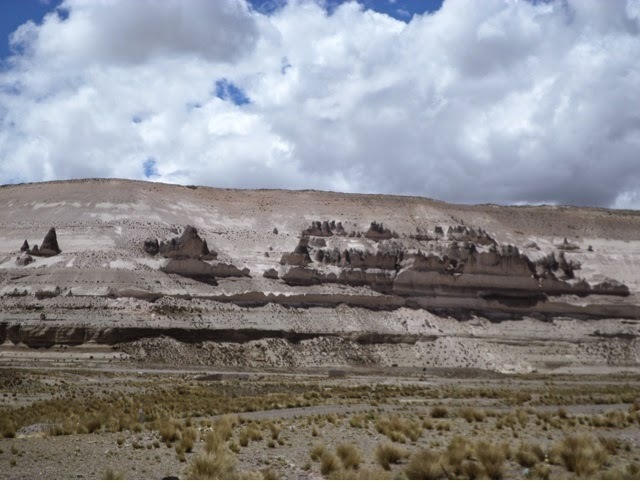 We then descended to Chivay town, which was just so spectacular! That afternoon we went round the town markets, which were very nice, but. Large hail storm forced us inside. I began to feel very ill, although I think more from a migraine than from altitude and ended up heading to bed. 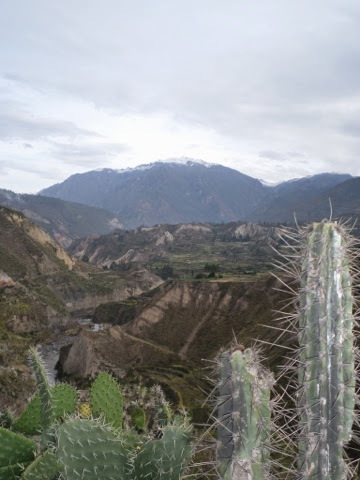 The next day we had an early start and drove to Colca canyon. Along the way we had great views of the terraces and old towns. The terraces date as far back as 150AD! 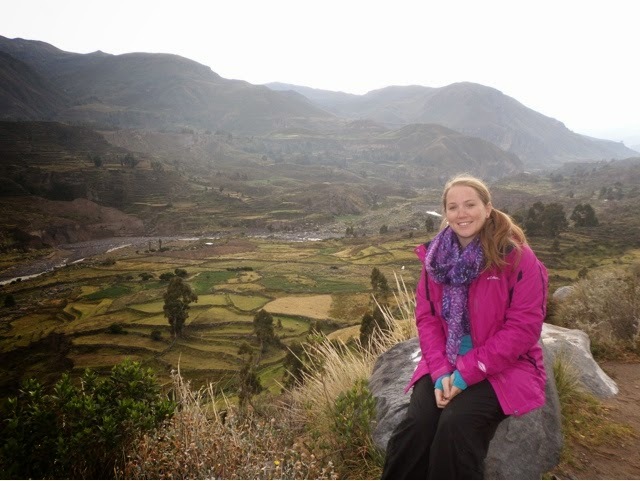 Many of towns in the Colca valley are actually Pre-Incan in age. 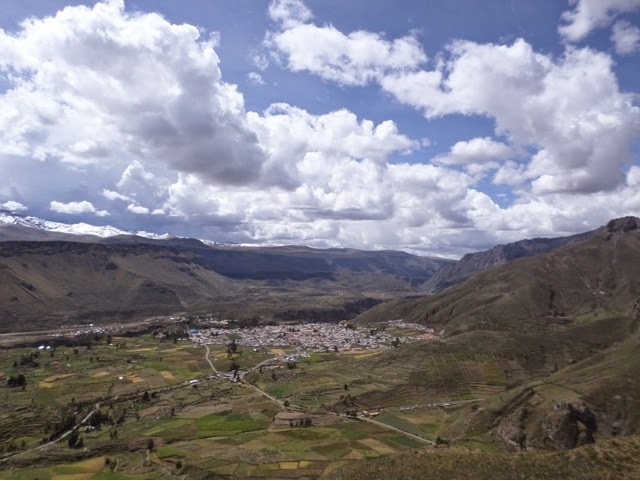 When the Incas conquered the area through marriage and not war, they found the advanced agriculture and established terraces to improve the agricultural production of the area. Many of the terraces are still used today and we saw lots of maize and quinoa crops. You can see some of the terraces going very high up some of the mountainside and they look completely inaccessible. Many of the higher level terraces are no longer farmed s people have moved down into the towns in the valley. As they arenot accessible with vehicles and farmers have to use animals in these areas they are not as productive or easy to work. Just like our journey at Banos we drove though some more interesting tunnels… They are just cut into the rock, in one there was just bare rock all around you. The second did have shotcrete but no other support. There are not even lights! You can see chunks of the shotcrete handing off the walls and the base is unfinished and the edges just have mounds of concrete powder. They are only just wide enough for a single mini bus and it’s best to think about it too much I reckon! 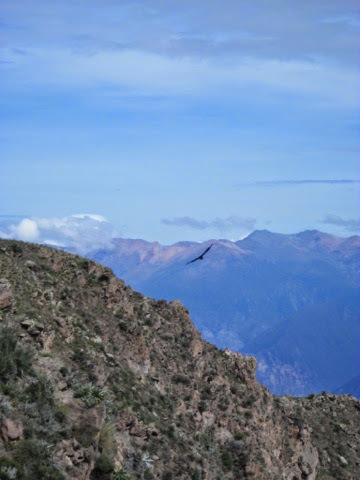 We drove to a view point to see Condors, world’s largest flying bird. Condors are only found in the North American Rocky Mountains and the Andes. Condors are gliding birds and depend on thermals. You can also tell just from looking at them if they are juveniles or adults. The juveniles have brown feathers, at around eight years of age these are replaced by black and white features with a distinctive white neck ruff. It is very hard to distinguish the males and females as they are very similar in size. The females have red eyes though. I’m not a huge one for birds or any flying things actually. The views of the valley were amazing though. I have to admit the condors were impressive, they were swooping right over head and are just enormous! They measure bout one metre long, with a three metre wing span! 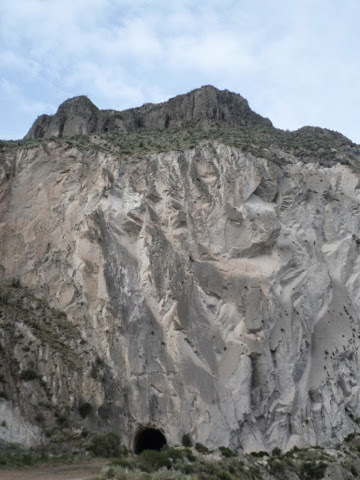 Colca Canyon is around 1.5 million years old and was incised by a river. Where we visited the canyon it is around 1.2km deep, but it goes to over 4km at its deepest point and is actually more than twice as deep as the Grand Canyon! The scenery is gobsmacking too, I just loved it it’s like the geologists equivalent of an amazing sweetie shop. I found it interesting that the source of the Amazon river is actually located in one of the valleys close to Chivay town! That’s a long way! The Colca river is actually only the upper 200km stretch of a 400km river system which runs out to the Pacific Ocean, although the two lower sections have different names, which I can’t remember! The valley also has over 250 cactus species some of which grow edible fruit, including the prickly pear and a sour kiwi-like fruit which is apparently good for hangovers. We then had to head back to Arequipa as the roads were about to be closed due to a local strike about a corrupt mayor! Back in town we had a lovely dinner at rooftop bar overlooking the city’s main square, it was very pretty all lit up at night. We then went out for a few drinks… Maybe not the best idea the day before another long bus ride, but fun all the same :-). Now it’s on to Cuzco and then Machu Picchu! 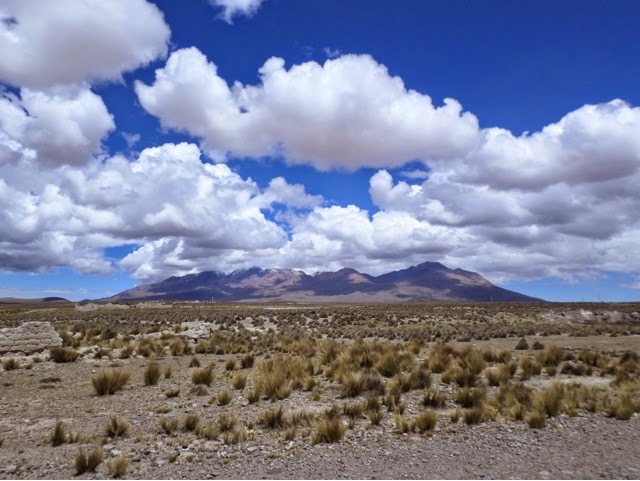 This entry was posted in Travel and tagged Alpaca, Andes, Camel, Chivay, Coca Tea, Colca Canyon, Condor, Intrepid, Llamas, National Reserve, Patapampa, Peru, Quechua, South America, SouthAmericanAdventure, Terrace, Travel, Vicunas. Bookmark the permalink.